John Gimson and Anna Burnet (GBR) dominate the 2019 Mid Winters to take their second win of the winter season. Over the eight race series their worst finish was a third place, and they also won four of the eight races. 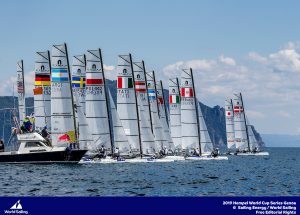 While the regatta was a fairly casual regatta and only a warm up to the World Cup next week, the fleet was large at 21 boats and included elite contenders from five continents. 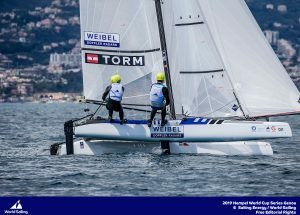 The British duo have steadily moved up the leaderboard since foiling was adopted and seem poised to remain in the medal conversation through Rio. Gimson was in the hunt for inclusion at Rio 2016, but sailed below his standards at the 2015 Test Event and the final qualifiers in Florida 2016. He and Burnet teamed up in September 2017, when foiling came to the Nacra 17 fleet and to date have never raced to worse than 8th. The duo won the Shanghai Cup in 2018,which helped fund their winter training plans. They were aided by team mentor, Ian Percy, this weekend. 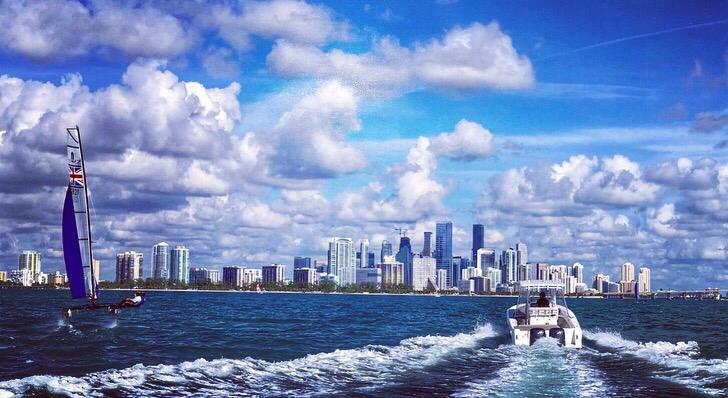 Gimson and Percy have a personal connection through the Artemis Sailing Team, and Percy also has extensive knowledge of Biscayne bay through his Star experience. Certainly a supporter any sailor would be envious of on their coach boat! Waterhouse and Darmanin (AUS) took second, Lange and Saroli (ARG) took third, and Zajac with Matz (AUT) took fourth. These four teams have been training together with the rest of the South American contingent in Punte Del Este, Uruguay, and seem to have found some magic as a group if the mid-winters can be any indication. ‘Punte’, as it’s affectionately known, is where the best summer parties are for Brazil and Argenina’s elite, but also is thought by these sailors to share some of the same characteristics as Enoshima, the sailing site of the Tokyo Olympics. Sea breezes that are accompanied by unencumbered ocean swells of huge proportion combined with offshore winds are on offer in both places. The regatta was picture perfect, with different conditions each day, including a very fresh day 2 where only two races were held. In the flat waters of Miami, foiling is always nice, and since the temperatures were a bit chillier than normal it kept some of the Miami motorboat chop down. 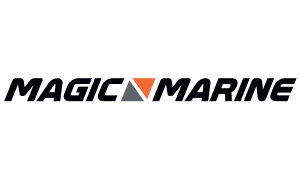 Returning to International racing was Iker Martinez with Olga Maslivets (ESP). The duo were disqualified from race 1 of the Sailing World Championship last summer before racing began and then withdrew. 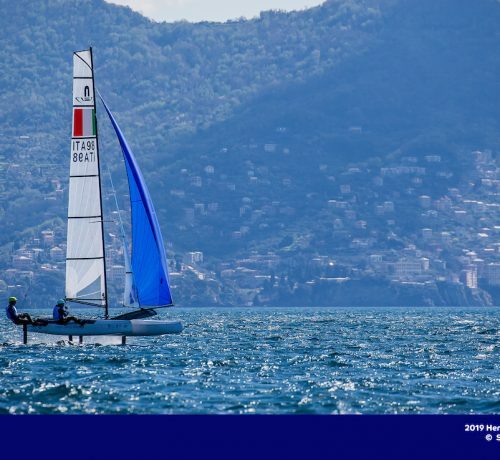 Neither World Sailing nor the RFEV opted to pursue additional penalties and therefore these two champions are fully eligible for further racing and are looking toward Tokyo 2020. The Miami World Cup begins on Tuesday January 29th, 2019.